Over the next few months, we are proud to be teaming up with Indiana lawmakers for an important cause. We will be working to raise awareness for childhood hunger and serving Hoosier families suffering from food insecurity. The new initiative, titled Eliminate 68, refers to the number of hours during the week in which a child is not at school where they have access to school-provided meals. For too many children in Indiana, these 68 hours represent time when they do not know where their next meal will come from. With a reported 1 in 5 Indiana children suffering from food insecurity, many children rely on school lunches as the only stable access they have to a meal each day. The Salvation Army has a longstanding reputation of providing nutritious meals to anyone in need, including through food pantries, meal programs and community gardens. Nationally, we provide 156,000 meals every single day. Our goal for Eliminate 68 is to serve as many people as possible throughout Indiana. With Corps Community Centers located throughout the entire state, we have the ability to reach people in every county, making us an ideal partner for this initiative. 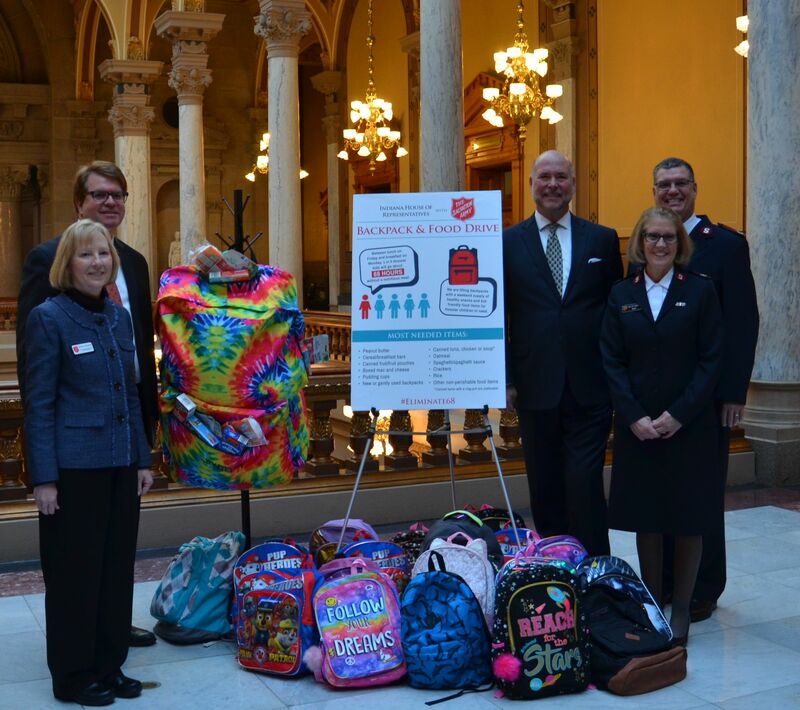 The Indiana House of Representatives will be collecting donations of new and gently used backpacks, as well as non-perishable food items to put together substantial meals for school-aged children across the state. Donations can be dropped off at the third floor of the Statehouse in downtown Indianapolis through March 5. The following day, our local lawmakers will fill the donated backpacks with the collected food items, such as peanut butter, cereal, breakfast bars, etc. We will then help to distribute these backpacks to children in schools throughout Indiana to provide them with kid-friendly meals outside of the school day. With this partnership, we hope to take one more step toward fighting childhood hunger, making sure that no child has to worry about when they will get to eat next.